On 20th January, 2011, Hilton Sanya Resort & Spa received the honour of "Best Resort Hotels in the Greater China Region 2010 "by Travel & Leisure, and Travel & Leisure Golf magazine at the Travel & Leisure Tourism Awards ceremony which was held in Beijing. Recommended by a great number of readers, surveyed by editors and journalists, experienced by third-party guests such as repeated hotel guests, and finally selected by authoritative experts, the Hilton Sanya Resort & Spa stood out and was deservedly awarded Best Resort Hotels in the Greater China Region 2010. Selection results in a bid to serve as a platform to highlight the strength of participating hotels and their brands, as well as deliver a valuable travel reference for business professionals and travel lovers. Commenting on the award, Jean Pierre Mainardi, General Manager of the Hilton Sanya Resort & Spa said, "It’s a special honour for the Hilton Sanya Resort & Spa to be recognized by China’s society for our outstanding property and exceptional services. We are committed to raising the benchmark of operational excellence and further tailor our services to meet the needs of increasingly sophisticated travelers." The 100,000 sqm sprawling Hilton Sanya Resort & Spa, located in Yalong Bay, overlooking 400m of pristine beachfront, was conceptualized and built with unique features and services to provide a True Resort Experience with a DIFFERENCE which aims to help guests to put back a little of what life takes out. 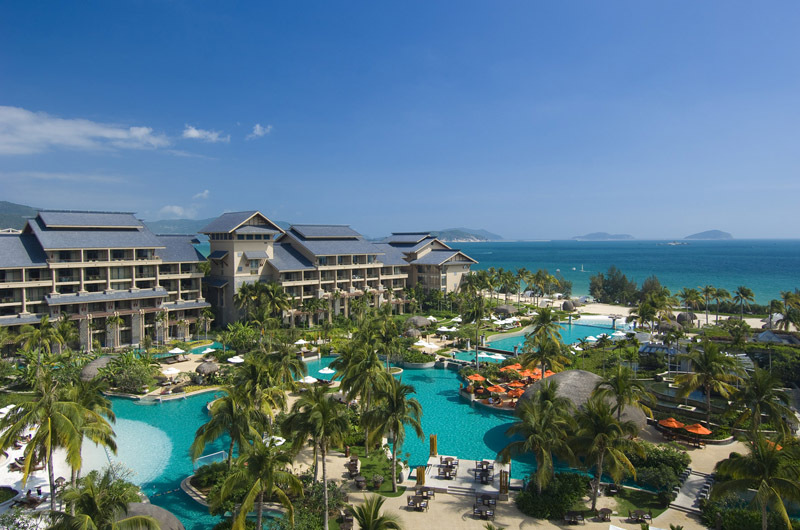 • Hilton Sanya Resort & Spa features a total of 492 guestrooms, suites and villas. It commands a prime location on 400m of unspoiled beach front at the western end of Yalong Bay, a 25-minute drive from the city of Sanya and 35-minute drive from the international airport. The average room size is 48.5sqm, with over 50% of the rooms overlooking a wide, crescent-shaped sandy beach and the South China Sea. The remainder has vistas over the surrounding National Park. The 6780sqm Spa Retreat encompasses a spa with eight treatment pavilions, a fitness centre offering exercise equipment, a reflex zone for traditional massages and foot reflexology, a relaxation area with deck lounges, steam room and sauna, and a tea lounge. Other facilities include six restaurants and bars, a 3800sqm resort pool resort, two tennis courts, Kidz Paradise, and a one-stop Yalong Bay Adventure Club. The resort also features a detached all-inclusive MICE Pavilion that offers extensive meeting and banquet facilities, more than 3000sqm of space on two floors, as well as two spacious outdoor event lawns. • Hilton International has linked up with one of China’s foremost developers, the China Jin Mao Group Co – the company behind the striking Jin Mao Tower in Shanghai. • The island enjoys a year-round tropical climate. It offers a treasure trove of activities including fishing, scuba diving, golf, visits to minority villages, cultural sites as well as proximity to the mainland and visa-free access. Infrastructure in Hainan is fast developing, with two international airports, a wide railway network and accessible ports. The Island has been chosen venues for several prominent events including the Hong Kong-Sanya International Sailboat Race held every November, Hainan Discovery Triathlon in 2002 and 2003, as well as the recent Golden Rooster Film Awards, Sanya Happy Festival, and more. Hilton Worldwide is the leading global hospitality company, spanning the lodging sector from luxurious full-service hotels and resorts to extended-stay suites and mid-priced hotels. For 92 years, Hilton Worldwide has been offering business and leisure travelers the finest in accommodations, service, amenities and value. The company is dedicated to continuing its tradition of providing exceptional guest experiences across its global brands. Its brands are comprised of more than 3,600 hotels and 600,000 rooms in 82 countries and include Waldorf Astoria Hotels & Resorts, Conrad Hotels & Resorts, Hilton Hotels & Resorts, Doubletree, Embassy Suites Hotels, Hilton Garden Inn, Hampton Hotels, Homewood Suites by Hilton, Home2 Suites by Hilton and Hilton Grand Vacations. The company also manages the world-class guest reward program Hilton HHonors®. For more information about the company, visit www.hiltonworldwide.com.